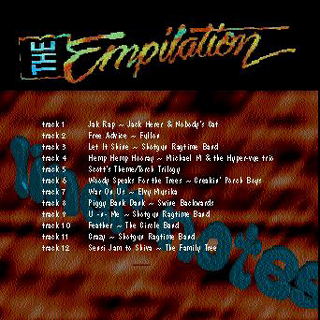 ...From the heart of the hemp movement, The Empilation is a collection of musical selections from musicians supporting hemp de-regulation. This audio disc contains twelve musical selections from hemp activists and up and coming musical talent from around the United States! The featured track, The Jack Rap, includes Jack Herer himself stepping up to do the backup in this frank and revealing expression of where the transgressions and imbalances exist culturally that have come from the regulation and persecution of the planets most important natural resource. This is not to be confused with the Hempilation, which is good too, you may want to go out and buy it too if you havent already!! (P) 1998 ©1993,94,95,96,97,98 The Empilation by Ocular Cuspidor,5715 West Plum Valley Road Rapid City, MI 49676. Printed in the USA. All rights reserved. Unauthorized duplication is a violation of applicable laws.